except Arcdesedo by Paul Plimely and Barry Guy, Come and Go by Barry Guy. Recorded at Loft Cologne, January 23, 24, 2012 by Ferran Conangla. Mixed and mastered by Ferran Conangla. Cover art: Gerda Steiner and Jörg Lenzlinger. Graphic design: Jonas Schoder. Liner notes: Marc Chenard. Photos: Cees van de Ven. Produced by Maya Homburger and Intakt Records. Published and copyright by Intakt Records, Patrik Landolt. 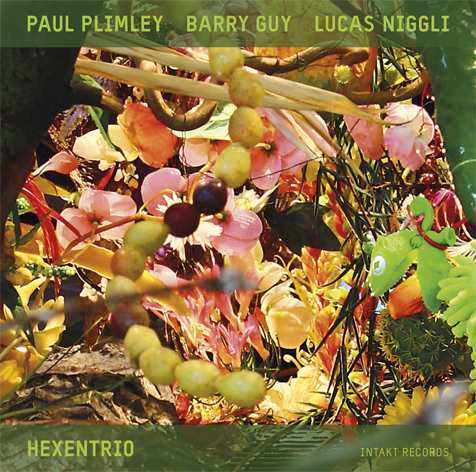 In the spring of 2012, during a tour of Europe, Plimley, Guy and Niggli recorded this album at a studio session in the "Loft" in Cologne, Germany. Barry Guy and Lucas Niggli had worked together a lot in the past few years. Pianist Paul Plimley, a Canadian with Irish roots, had made himself a name as one of the founders of the New Orchestra Workshop (NOW). There Plimley came to the attention of Han Bennink, Gerry Hemingway and Barry Guy. 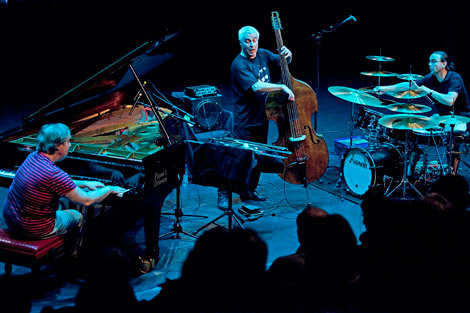 In 2009 Lucas Niggli played with Plimley at the festival in Vancouver, and the trio with Barry Guy was born. The album contains distillations of their "live"-performances – pieces with a sharp focus often developed out of quiet sequences. "There is a remarkable sensitivity, which truly shines in the slow numbers", writes Marc Chénard in the liner notes. "On the flip side of the coin, they can push and shove with the best of them, and there are more than a handful of those moments, too. Most importantly, though, this spirited team shows us how true freedom lay not only at the outer limits but also within them." Im Frühjahr 2012, während ihrer Europatournee, entstand im Loft in Köln die Studioaufnahme des «Hexentrios». Der in der Schweiz lebende Bassist Barry Guy sowie der Schlagzeuger Lucas Niggli arbeiten während der letzten Jahren intensiv zusammen. Der Pianist Paul Plimley, der Kanadier irischer Herkunft, machte sich bereits Ende der Siebzigerjahre als Mitbegründer des New Orchestra Workshop (NOW) einen Namen. Zahlreiche Musiker wie Han Bennink, Gerry Hemingway und nicht zuletzt Barry Guy wurden auf Plimley aufmerksam. Im Sommer 2009 lernte Niggli den Pianisten bei einem Gastauftritt am Festival in Vancouver kennen. Hier wurde das Trio Plimley-Guy-Niggli aus der Taufe gehoben.